Jessie Jones Eckhart, 94, of Lititz, PA passed away March 18, 2019 at Brethren Village. She was an amazing daughter, sister, wife, mother, grandmother, great-grandmother and friend. Her life was dedicated to her family, friends and flying. Born in Pughtown, (Chester County) PA, she was the daughter of the late Jesse P. and Reba S. Morrison Jones. She was the wife of the late Dr. Howard D. Eckhart who passed away on December 24, 2014. Jessie was the daughter of aviation pioneer Jesse P. Jones of Lancaster. She learned to fly airplanes before she received her drivers license. She had a passion for flying her entire life and soloed at the age of 16 as a junior in high school. After graduating from J.P. McCaskey High School in 1941, Jessie attended Penn State for one year studying Art Education prior to becoming a flight instructor. 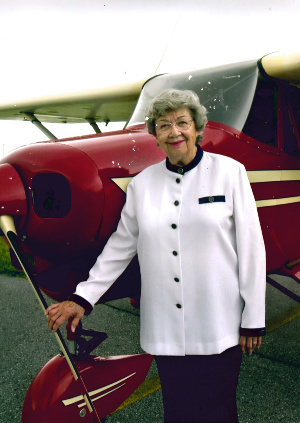 She worked for the Navy and Army Government Contract Schools as a flight instructor during, and after, World War II. She was a member of Aero Club of Lancaster, former member of Lancaster Country Club, 99 Club (a women’s pilot club) and the Chi Omega Sorority at Penn State. Her hobbies included oil painting, traveling with her husband Howard in their airplanes, skiing, hunting, embroidery and she was an avid scrapbooker. Her survivors include two sons: Dr. Michael P. Eckhart, husband of Deborah L. of Lancaster and David J. Eckhart, husband of Mary Loughead of Pottstown, PA; six grandchildren: Stephanie L., wife of Adam Cahoon of Lancaster, Suzanne C. Eckhart of New York, NY, Kate E., wife of Max Flessner of Mechanicsburg, PA, Dr. Jennifer E. Eckhart of Lancaster, Derek D., husband of Ceren Eckhart of Los Angeles, CA, and Jake Eckhart of Pottstown, PA; and one great-granddaughter, Avaleigh K. Cahoon. She is also survived by her sister A. Carolyn Carter-Shultz of Lititz. She was preceded in death by her husband, Dr. Howard D. Eckhart, by her son Howard S. Eckhart and by her sister, Helen J. Carter. Praying God’s tenderest blessings to attend you, to give you comfort and peace! What a remarkable woman and a life well lived. I send love to all of you! Dearest love and deep condolences. You are all in my prayers, as you say goodby to such a precious women. What a terrific lady, I’m a better person for having known her. My deepest condolences. You are in my thoughts and prayers. What can an average person like me say about an extraordinary person like Jessie? I have been a friend of Jessie’s for a long time and have always been amazed by what she has accomplished in her lifetime. Her obituary barely touches her life and I enjoyed helping her compose it. Jessie had a way of getting me to come visit her “one more time” to discuss something about her funeral arrangements and her obituary! I loved my visits with her which often included lunch at Chives. She wanted to know about my parents and my family, remembering their names. We shared confidences with each other knowing we could trust each other. I’ll miss you Jessie; your sense of humor and your laugh most of all. So sorry to hear of Jessie’s passing. May your fond memories help sustain you during this difficult time. We were extremely fond of Jessie ever since we met at the Lancaster airport in the early 70’s. We spent many happy hours in the Ready Room and in the cabin on Arrowhead Lake. When Howard and Jessie visited us in Helena, Mt. we all had a great time boating and hiking at Gates to the Mountains. She like her father was a legend in aviation and will be missed dearly . Lancaster Airport will never be the same again without her. It was with great sadness I read my wonderful friend’s obituary. Such a delightful, awesome lady! I treasure the precious memories of eggnog and oyster pie (Howard’s) at their Christmas Eve parties, the breakfast flights John and I shared with them and the EAA Oshkosh gatherings and giving some Benjamin girls flying instructions!! Of course my mind goes to the smoked cheese old Jess (my husband’s idol!) gave us every year. A super lady, Jessie, one of a wonderful family. I pinned her down a few years ago about the “Hooray, hooray, the first of May” card we received for years. No, she didn’t fess up….but I knew how clever she was! God bless her as she soars on the wing of an angel….in control of the instruments. My love to all. Dave, so sorry to hear of the loss of your mother. Prayers and thoughts to you and your family. I am sorry to hear about the loss of your mother. Jack and I extend our deepest sympathy and condolences on the loss of Jessie. She was a wonderful awoman and we were always happy to see her and reminisce. She will be missed. What a very special woman in so many ways. For all her accomplishments the thing that always came across was what a special lady she was and how she always made you feel so special to her. She just enjoyed people and her annual cards always made you know you were thought of. She was adored by all who knew her and will always be remembered by both Steve and me. Our family feels honored to have known such a very special person! Our sympathy and love to the family! My sincere sympathy to the Eckhart family on the passing of Jessie. While I did not know her personally and met her & Howard on a few aviation occasions, she is part of a owner/pilot aviation family legacy started by her father the late Jesse Jones at the Lancaster Airport. She inspired others to live and love flying in all aspects. One could call the Jones/Eckhart the “First Family” of aviation at the Lancaster Airport. Her accomplishment will long be remembered. My deepest sympathy to you and the whole family. The matriarch leaves a wonderful legacy! My deepest sympathy to Michael and David and their families’ on news of dear Jessie’s passing. And as mother, Jessie was as warm and true a Heart in Friendship. My folks were blessed to shared a long friendship with her and her late husband Dr “Howie” Eckhart. And I know I speak for them, as truly as I speak for myself, through lifetime of travel and bar-b-ques too numerous to remember, her warmth and good humor did abide. Michael and I send our deepest sympathy and love to Michael, David and your families. The loss of dear, vibrant Jesse brings the final curtain closer on the wonderful group of our parent’s friends who surrounded us kids with their fun loving camaraderie and, at times, their outrageous antics. The opportunity to reconnect with Jesse in my later years was a gift. She remained the joyful interesting vibrant Jesse I knew as a child and provided me with a shining example of how to age gracefully. She simply knew how to soar in so many ways. I trust her energy and her spirit will continue to abide within the Eckhart family as life goes on. We were very sorry to learn of Jessie’s passing and Hib and I want to express our sympathy to all of you. Jessie was a wonderful person filled with spirit and love. We were pleased to know her. We know all of you have many memories of her and we hope those times will comfort you as you deal with her passing. We are currently in Florida and will be unable to attend Jessie’s service tomorrow. So sorry to learn about Jessie. She was a treat and we were blessed to have known her . We will miss but not forget her smile, warm greetings, stories and traditional May first greeting. Our condolences to the family. I would like to express my deepest sympathies to Jessie’s family. Though I didn’t know her well, I remember warmly her gracious hospitality and vivacious spirit. I never got far off the ground as a pilot, but she was an inspiration to me. I got to know Jessie a while ago at a hair salon where I worked. We were fast friends and she would come in early and regale me with stories of her past, her family, and more often than not – weekend plans. She was always interested in what was happening in my life and would, occasionally, proffer up advice (such as: you can’t wear dungarees on a date!). So grateful to have known this lovely human being! Can’t help but imagine her out there laughing as she navigates the celestial skies! She sends her sympathy to the family of Howard Eckhart. What a sad shock to learn that Jessie has died. I was working on a birthday card for her 95th birthday, just days away, when I found the news online. My parents were friends of Jessie and Howie, and I babysat for young Howie, David and Michael long ago. As a teen I treasured visits to their Rattlesnake cabin near Renovo. I moved to Oregon, took up flying, reconnected with Jessie and became one among so many friends she somehow made feel very special. On visits I’d sit in her kitchen while she took call after call from friend or family member, observing how she shared her friendship so generously with so many. I was awestruck sitting in Jessie’s hangar with her in front of the photos of her flying times, and those of her illustrious father, sharing flying stories. All my love to David, Michael and others of her family. Jessie is a legend in my family. My grandfather was Lawrence W Jones, Jesse Jones’ first student pilot and parachutist in Lancaster. Working as a police officer in MT I saw Jessie’s picture often in the case at Lancaster Airport. I have many old photos of the Jones family when they were flying the old planes and parachuting. Jessie had an amazing life that very few can ever reach. What a great woman, pioneer and aviator. Thank you for everything you did for aviation and Lancaster. We were so saddened to hear of your Mom’s passing. We were also unable to attend her services but heard from Sue Scott that your comments were very meaningful and touching. The many years of our families being so close on Blossom Hill, as well as our personal and professional contacts were all important aspects of our lives. And Jessie’s passing is clearly the end of an important era in all our lives. She and your dad, and my parents will all be missed forever. You don’t know me but I was a dental classmate of Howie and a life long friend of both Howie and Jessie, Also, a fraternity brother of Howie. We had some wonderful times together at Penn but mostly in St. Augustine when they had their condo. I have corresponded with Jessie for years and loved hearing of her growing family. I know you’ll miss her greatly as will I. Not many people write letters anymore, but we did, quite regularly. My heartfelt condolences to all of their wonderful family.